Posted by live2cook in Cherishing Dinners, Egg free. 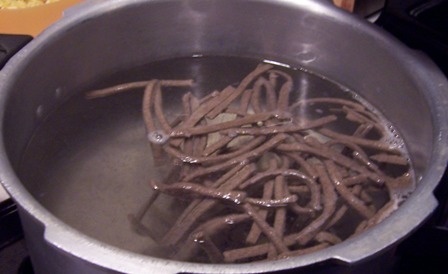 I was making pizzoccheri for our dinner. Rolling and cutting the dough, dropping the shaped pasta in boiling water….things were moving in a rythm. The finished pasta dish turned out wonderful. While we enjoyed our dinner, DH reminded me of an incident. It was about my stay in the hospital when our son was born. Since my Mom’s visa got delayed, she was not able to make it to US till a week later. So, we decided to go with the meal options that the hospital offered for the patients. Yes! The only Italian food that we knew at that time was “Veggie Pizza”. My efforts to figure out the foods that will suit our diet opened so many doors. 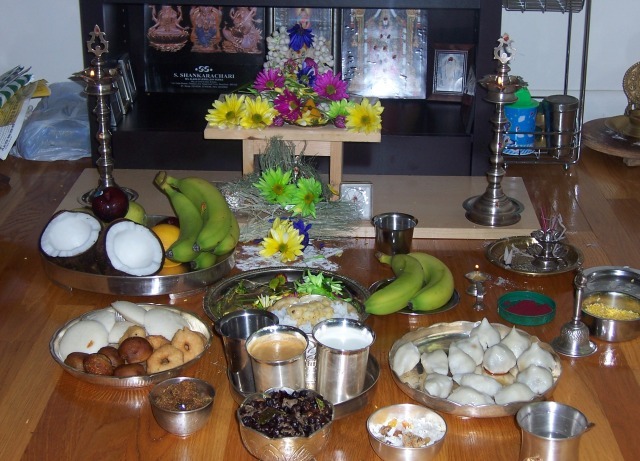 Next to Indian cuisine, a cuisine that rendered itself to vegetarian diet is Italian. With the help of library books and internet, I collected a lot of Italian recipes. Among those, the recipe for pizzoccheri pasta, inspired me a lot for two reasons. It is egg free and the process of making the pasta is so simple. When Meeta asked us to prepare authentic Italian recipes, I decided to prepare this pasta. I thank meeta for hosting this wonderful event which inspired me to learn the history of this wonderful recipe. If not for this event, I would not have researched for more information other than the recipe. 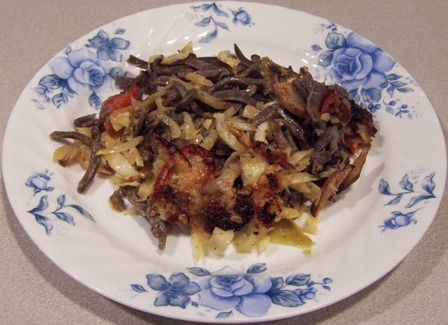 Pizzoccheri is a recipe from Valtellina, a valley in Lombardy region of Northern Italy. The main ingredient of this recipe is Buckwheat. 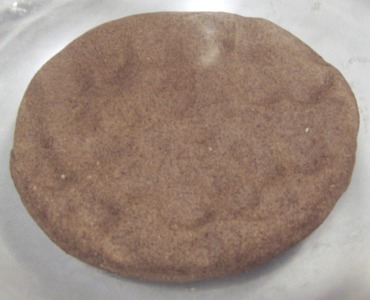 The etruscans and saracens introduced the buckwheat grain to Italy in 14th century. 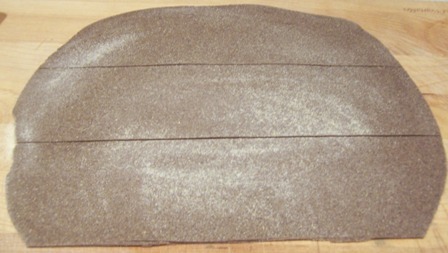 During that period buckwheat was a staple in that region and recipes like buckwheat polenta emerged. But with the introduction of Maize made these buckwheat recipes less popular. 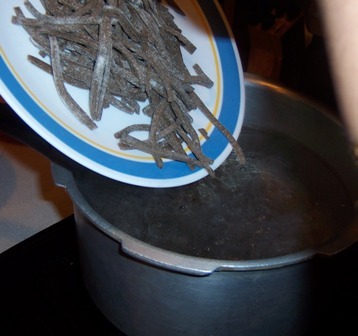 The Academy of pizzochero Teglio registers and maintains the traditional recipe of pizzoccheri. As per the academy, there was a mention about pizzoccheri in a 15th century book written by Ortensio Landi. He mentions that a cook named Melluzza Como was the inventor of Lasangna, Pinzocheri, etc. 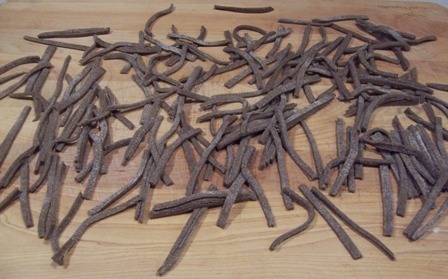 Since there was no other information documented, we are unable to learn more about the origin of this pasta. Though the meaning of the name is debatable, the most acceptable origin is the word “Pinzoccher“, which denotes the religious women who sacrificed their life for God. Whether the recipe was prepared by them or the dough resembled the beige colored dress that these women wore, the pizzoccheri stands to represent the simplicity of their lives. The English version of the recipe can be found here. 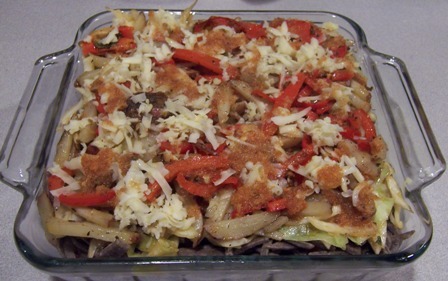 I layered the vegetable, cheese and pasta. Baked it for 15 minutes in a 375F preheated oven and served it as a casserole. Seasoned with garlic butter and baked in oven. Pizzoccheri is ready to dig in! Posted by live2cook in General.